Rival rallies have been held in Aleppo, Syria's second city, as troops continue their assault in nearby north-western villages, activists say. Around 1,000 anti-government protesters gathered in at least two locations, but activists said they were beaten and dispersed by pro-government "thugs". Although small, the protests indicate growing dissent in Syria's second city, which has so far been immune to unrest. Meanwhile, President Bashar al-Assad's supporters rallied in the city square. Syria has been rocked by three months of anti-government protests which pose the greatest challenge to four decades of authoritarian rule by President Assad's Baath party. The Syrian authorities have responded with overwhelming military force that has drawn criticism from Western governments. According to human rights groups, some 1,700 people - civilians and soldiers - have been killed and tens of thousands more injured or arrested. An estimated 10,000 people have fled to Turkey, where they remain in refugee camps. 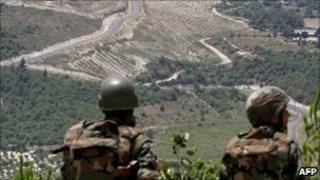 On Thursday, Syrian army forces spread through the mountain villages in Idlib province, near the Turkish border area. Activists said 19 people had been killed in the past two days in the Jabal al-Zawiya area. The reports are difficult to verify because most foreign journalists are barred from the country. The action by Syrian troops appeared to be aimed at preventing residents from fleeing to Turkey, activists told the AP news agency. "[The authorities] fear there will be sympathy for the people who are fleeing, and they are frightened that this will cause international pressure to mount on the regime," Mustafa Osso, a prominent Syrian-based human rights activist, told AP. French Foreign Minister Alain Juppe is due to meet his Russian counterpart later this week to discuss the situation. Western countries hope to convince Moscow to back a UN resolution condemning Syria. The US treasury department said on Wednesday it was imposing sanctions against Syria's security forces for human rights abuses and against Iran for supporting them. President Assad and six top aides already face US sanctions. The president is also on a list of 23 figures subject to an assets freeze and an EU travel ban.